This article was first published by XSPlatforms, and is republished here with permission of the authors. © 2018 XSPlatforms. Adverse weather conditions: Weather conditions influence work at height that is done outside — take the weather conditions into account during a pre work briefing! 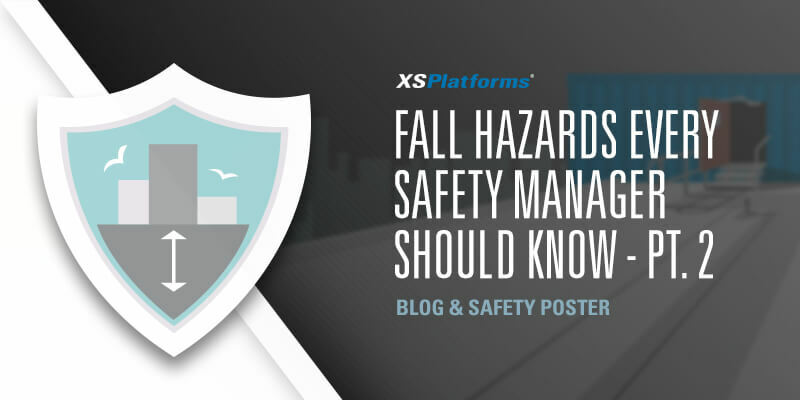 In our previous blog we raised awareness for the dangers of falling from heights and four fall hazards that safety managers should know about. In this second part we look at another four hazards that can cause serious incidents. Awareness and knowledge of fall protection can help prevent incidents. Any edge that is unprotected while work at height is executed poses a danger. This does not only apply to roof edges, but also to edges of elevated work platforms, loading docks, walkways etc. Guardrails and safety gates help protect these edges, but there are situations where a guardrail would prevent the work, for example on a loading dock. In such cases other protective measures need to be taken to ensure worker safety. A risk assessment and advice from a fall protection expert will help determine what solution best suits the situation. People who have to work at height are at risk and employers have the duty to educate employees and provide the measures to protect them. In situations where guardrails provide collective fall protection for everyone at height the training is less extensive. People who have to work with fall protection Personal Protective Equipment (PPE) in order to attach to a fall protection system will have to receive extensive training on the proper use and upkeep of this equipment. Improper training causes a safety hazard as fall protection equipment could be used erroneously and a person could hurt themselves or others. Poorly maintained and inspected fall protection equipment poses a danger to all those working at height. Fall protection PPE for example has to be inspected visually by the user before each use, and annually by a competent person to ensure it is still safe to use. Fall protection systems also need to be inspected on wear before use, for example before attaching to an anchor point and stepping out of the safe zone the anchor needs to be inspected visually as well. As manufacturer of fall protection we recommend an annual inspect of the system as well. If fall protection equipment has been involved in an incident, or if signs of damage are detected take the materials out of service immediately. Get a competent person to inspect and re-certify the system and PPE. Weather conditions influence work at height that is done outside. Heavy rains or frost can make a surface slippery. Extremely sunny conditions influence a person’s body and can cause heat stroke. Work at height should be stopped when there are strong winds. And so on. The weather has an effect on people, the roofing material and the fall protection system. So take the weather conditions into account during a pre work briefing. In two blogs we outlined eight hazards related to falling from height. By no means is this an extensive list of all fall hazards. We highlighted these risk because they are fairly common and knowing about them can help prevent them. Managing safety means understanding fall hazards and working to prevent them. Different equipment and measures help prevent fall risks, we have put the fall hazards together in a handy downloadable poster with possible measures to combat the risks. You can download part 2 here, for part 1 we redirect you to the first blog of this mini series. We urge all safety professionals to perform a risk analysis to identify the hazards present and the best possible equipment for the situation.